Who wants to see a Freeway Series ? Dodgers vs Angels in the World Series. Bill Plaschke of the L.A. Times wants to see one. I really don’t care. I want to win a World Series. It doesn’t matter who we beat. A more interesting series would be against the Boston Red Sox. Imagine that. Also, I think it’s too early to be talking about a potential Freeway Series. The Dodgers and Angels have to beat 2 teams before reaching the World Series. It’s not even in my mind. Let’s beat the CUBS !! I met 2 current Angels. Ervin Santana and Robb Quinlan. First up was Santana. He was signing at a furniture store down in Irvine at 11:30 am. I showed up right before 9 am. A employee there told everyone that Santana will be signing 2 items per person. Sounded good since I needed to get a picture signed for my brother. Well right before 11 am, another employee said that he will be signing only 1 item per person plus a picture with him if you desire. Bad news for me since I had that extra item. 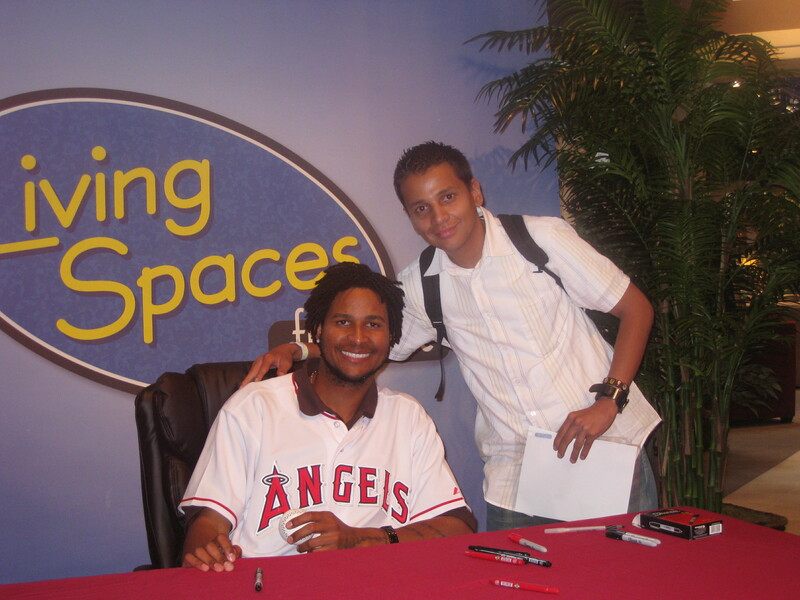 Upon arrival to Santana, I gave him a 2008 All-Star ball to sign it. He signed it right below the All-Star logo. Then I put the picture down in the table and right away the employees said “NO! just 1 item plus a picture” They were very strict about it. It’s weird because most of the time they don’t want you to be posing with the players. It’s just the autograph and that’s it. But on this occasion, everyone was taking a picture with Ervin. Maybe that’s the reason the line was moving slow. My Wife got him to sign a mini-helmet that already has several autographs of current Angels. Then after meeting Santana we headed over to Laguna Niguel. Robb Quinlan was signing autographs at a at&t store. Nobody was there. I think less than 5 fans. I got him to sign the same mini-helmet. Quinlan was very nice and talked with us. Pictures from the events below…. Today I met Reggie Willits. He signed the same Angels Mini-Helmet that I have been getting autographed for current Angels Players. Signing was scheduled at 11:30 am Guess where ? Yeah at a AT&T Location! I guess those Angels players are going to all the AT&T locations. lol 🙂 I got there around 10:15 am Not alot of people were there. Then around 11 am it started to get full. Willits didn’t talk much. Just signed the items and went to the next item. My Wife got him to sign 2 items. I only got him to sign 1 item. I guess I was scared since he refused to sign 2 items to another fan. 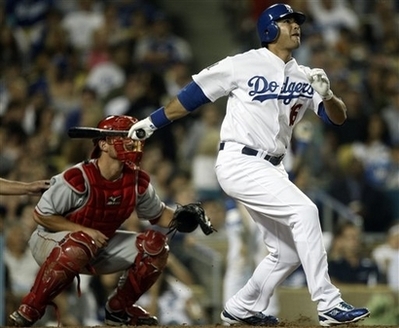 Mr. Torre, can you just play Andre Ethier every day ? Great win last night. I never thought we would beat Joe Saunders. Let’s get another W ! 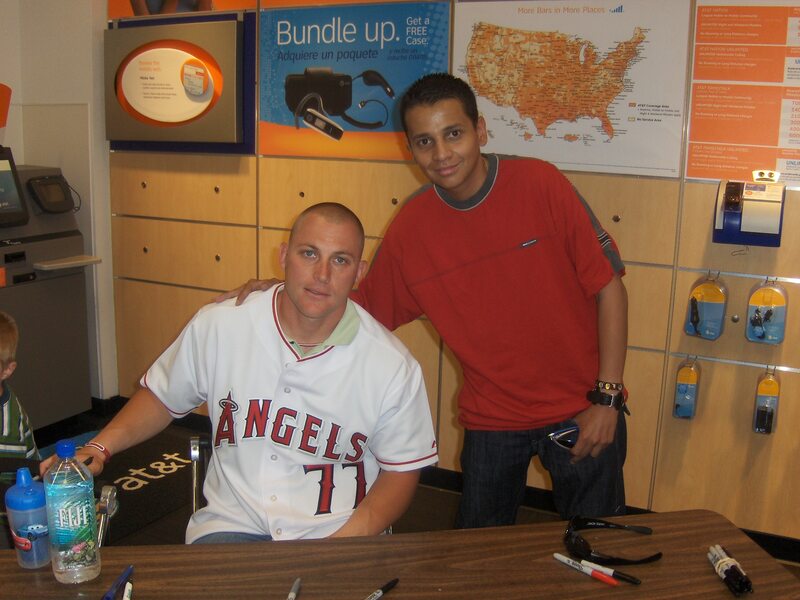 Heyyyy…Yesterday I met Jeff Mathis, the other Anaheim Angels catcher. 2 weeks ago I got Mike Napoli. He was also signing at a At&t store but in a different location. I got him to sign the same Mini Helmet. Mathis was really cool. Willing to sign anything and take pictures with the fans. I told him I liked his hat since it says “BooYaa” I say that often since that one dude in ESPN says it all the time. Boo yaa!! He laughed.